I’m pleased to announce the release of our latest eBook! 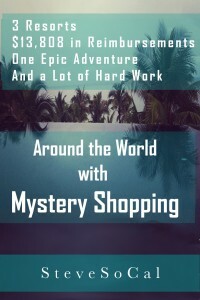 This 31 page e-book is the story of a mystery shopping adventure that spans the globe. It is about the very best assignments available to mystery shoppers. Imagine traveling to remote resorts and high-end restaurants, while getting reimbursed for every expense. That is the type of adventure SteveSoCal set out on. It turns out that mystery shopping can be a lot of work. This book is about planning and logistics and much as it is about luxury and world travel. If you’ve ever dreamed of snatching the very best assignments in faraway places, this book is both a warning and a guide. You’ll be in for an amazing adventure. But not without pitfalls. In this book, Steve shares the ups-and-downs of his latest trip around the world as a mystery shopper. He starts with an ultra-high-end hotel on the California Coast, visits Hong Kong, Singapore, the Maldives, Mexico, and more. It’s quite the adventure – and, as you’ll discover, quite a lot of work as well.